Cerike Enterprises 30 Day Return Policy, unused, unbroken, no defects. 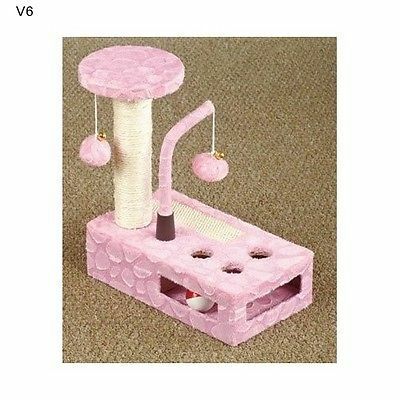 Cat Play Gym Pink Activity Post Pet Scratch House Tree Condo Movement Develop Only 1 In Stock Order Today! Product Description: Complete Cat Play Gym is covered in soft plush fabric and is so suitable for cats of all ages and activity levels. The sisal post gives your cat a healthy outlet for its scratching instincts, a concealed ball inside for play, 3 peek-a-boo holes on top and 2 side openings so they can swat at the ball from the inside. Too cute!!! The two hanging balls have bells for added excitement. 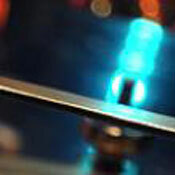 13-1/2" x 12-5/8" x 7-3/4". Wooden, polyester, cardboard and sisal. Easy assembly required. Key Features: 13-1/2" x 12-5/8" x 7-3/4" Wooden, polyester, cardboard and sisal Shipping: Shipping is available within the lower 48 US States. We Do Not Ship to PO/APO Boxes, HI or Alaska We Do Not Ship Outside of the Continental US All items ship within 24-72 hours of Payment For large items that require Freight shipping a valid phone number is required to call and schedule your delivery Terms of Sale and Feedback: Feedback is extremely important to us and eBay If you are satisfied with our transaction, please take a moment to leave Positive Feedback. YOUR Satisfaction is our #1 Priority! If there are any issues, PLEASE contact us BEFORE leaving a neutral or negative rating so that we may resolve any concerns. We PROMISE we can make you happy if you give us a fair chance. Returns / Concerns: All items qualify for returns within 14 - 30 days of receipt. Buyer is responsible for return shipping on any item that is not damaged Please be sure this is an item you want before making your purchase. Customer Satisfaction is our TOP priority! All items are IN STOCK at time of listing. Inventory on eBay changes constantly and it is impossible to maintain a perfectly accurate count of all items. Please do not penalize us if we have to issue you a refund! Thank You For Your Business!